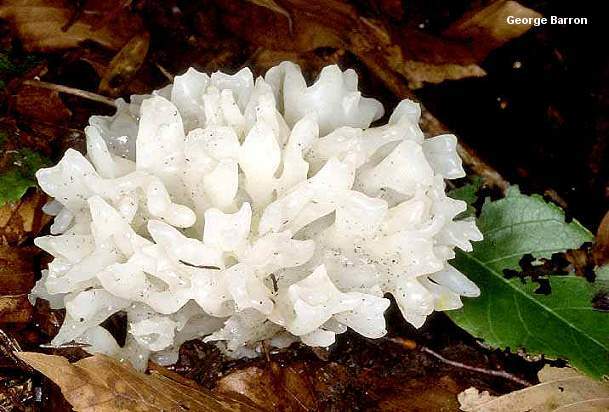 This jelly fungus is found in eastern North America's hardwood forests, and can be recognized by its fairly large size; the relatively firm branches it develops (unusual among the often-flabby jellies); and its tendency to grow terrestrially, rather than on wood. Microscopic features (see below) will confirm identification. Ecology: Saprobic--or possibly parasitic on the mycelium of other fungi, like other species in the genus (though I find no record documenting a host); growing terrestrially (often near stumps) or on well rotted wood in hardwood forests (especially under oaks); summer and fall; fairly widely distributed in eastern North America. 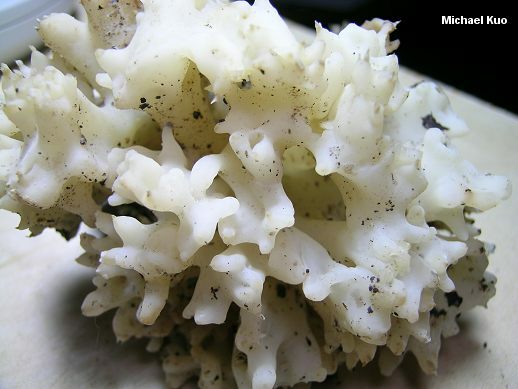 Fruiting Body: Gelatinous but fairly firm; when young and fresh composed of flattened lobes or sections arising from a more or less central area; with age the lobes developing into hollow, finger-like branches; up to 8 cm high and 15 cm across; with a smooth surface; white, becoming creamy or slightly brownish with age. 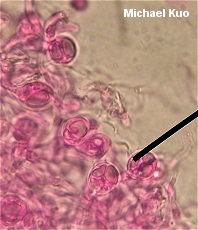 Microscopic Features: Spores 9-11 x 5-7 µ; more or less elliptical; smooth. Basidia 4-spored; becoming longitudinally 4-septate (cruciate) with maturity; 11-15 x 8-11 µ.
REFERENCES: (Berkeley) Farlow, 1908. (Smith, Smith & Weber, 1981; Phillips, 1991/2005; Bessette, Miller, Bessette & Miller, 1995; Barron, 1999; Roody, 2003; McNeil, 2006; Miller & Miller, 2006.) Herb. Kuo 08010801.